CONCORD, N.C. – Spire Motorsports, through a partnership with Chip Ganassi Racing announced today that 2010 Daytona 500 Champion Jamie McMurray will drive the No. 40 Chevrolet Camaro ZL1 for the 2019 Daytona 500. McMurray will be making his 17th start in the “Great American Race”, when the Daytona 500 kicks-off the 2019 Monster Energy NASCAR Cup Series regular season on Feb. 17. The No. 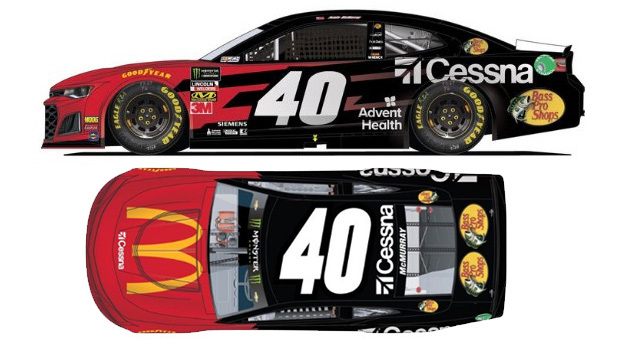 40 Chevrolet will feature branding from Bass Pro Shops, McDonald’s and Cessna to recognize the long-standing partnerships that the companies have had with McMurray over the years. Bass Pro Shops and McDonald’s have been on McMurray’s cars since 2010, while Cessna has been with him since 2013. Bass Pro Shops was the primary sponsor on McMurray’s car for all three races that he won in 2010 (Daytona, Indianapolis and Charlotte). “I’m excited to have the opportunity to potentially be a two-time winner of the race and it would mean so much to celebrate one more win with all of the great partners that have been with me for so many years,” McMurray said. Spire Motorsports was established in 2018 by longtime NASCAR industry executives Jeff Dickerson and Thaddeus “TJ” Puchyr. The team, led by veteran and championship winning team President, Joe Garone, will field an entry for the 2019 Monster Energy NASCAR Cup Series season. Spire Motorsports will focus on growth, development and performance. The team is based in Mooresville, N.C.